I recently purchased a DDRC-22D after reading some glowing reviews online, hoping it would take my system to the next level. I ran the setup process and did the initial measurements in the 'chair' profile as that's how my listening room is set up. While I do notice some improved clarity and a 'forewardness' of vocals, it took my previously nice wide soundstage and compressed it dramatically towards the center, the width is almost completely gone. I tried remeasuring using the 'Sofa' profile and while it may have broadened it a bit it still wasn't close to the original, and added a muffled cloudyness to everything. Figuring that perhaps my presence in the room might have been an issue during measurements, I purchased a longer USB cord so that I could operate the computer from outside the room during test sweeps, and while that seemed to help a little bit, it still sounds very veiled using any of the 'Sofa' measurement curves. I even tried a curve with correction only below 1khz, and I still get that muffled quality that I don't hear when I run my system through the analog inputs on the preamp bypassing the DDRC-22D. I've also tried hitting the 'Dirac curve off' button on the remote, and it does nothing to widen the soundstage or remove the muffled sound in Sofa settings, but when switching back to the analog inputs the muffled-ness goes away and the soundstage widens back up. 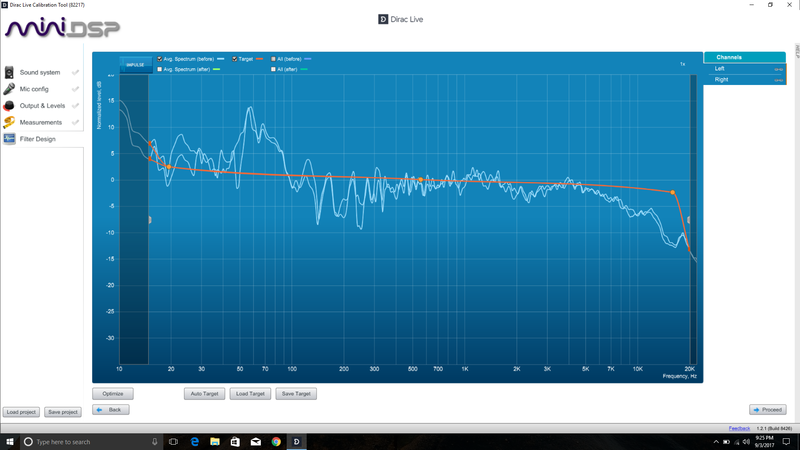 I've also noticed that when playing through the DDRC-22D the volume is attenuated by about 10db. Reading the manual I see that it's set by default to do that, so in my second round of measurements I set it to 0db before doing them, only to find that it didn't raise the level of the new measurements, but only on the previous measurement slot I'd filled (previously measured under the -10db setting) and had left alone as a comparison between my new and old trys. Ideally I'd like to have the DDRC-22D not attenuate the volume at all so that I can easily compare between the analog inputs and digital inputs without having to adjust volume between the two. My source is a Bluesound Node2 running through an Emotiva PT-100 preamp, a Crown XLS1502 amp, and Infinity Intermezzo 4.1t speakers. The BlueSound Node2 outputs in analog and digital at the same time, and I have it hooked up both ways to my preamp so that I can switch between having the DDRC-22D in the chain and without to compare. Am I doing something wrong? Should I be using a different microphone measuring pattern? I'm at a loss, I feel like this should be doing amazing things for my system, but so far I haven't been able to get it to do them. Any help is greatly appreciated, thanks! Could provide a link to your Dirac Project & DDRC-22D configurations? Or, could you upload screen captures? Also, do you have any other measurement system, such as REW? That would enable us to see what is happening. The DDRC-22D is basically a 2x4HD running the Dirac plug-in, and as default the 2x4HD will attenuate signals passing through it, unless you change the internal switch settings - something I did before even powering it up, as I had already measured the levels from pre-amp and to power-amp sections. Perhaps confirm the microphone orientation and the calibration file used? The 10dB attenuation is necessary for Dirac to do its thing, if you ramp up the gain you will cause clipping. Hi Mike, to avoid confusion, you are thinking of the DDRC-24. The DDRC-22D is digital in and out, using different (internal) hardware. No problem, here are the project files, the first 'chair' using the chair measurement, 'sofa' using the sofa measurement, and 'sofa_outside' using the sofa measurement but with me standing outside of the room during the measurement process. They're apparently too large to upload to this forum, so here's a link to download them from my OneDrive. I'm using the standard, not the 90 degree, and I'm using the calibration file downloaded from the MiniDSP website based on my UMIK's serial number. Is the 10dB attenuation to reduce the risk of clipping the output of the DDRC-22D or the amp? I have plenty of headroom with my amp, and I don't tend to listen at extremely high volumes. I just thought it would be nice to be able to A/B test between the analog input and the DDRC'd input without having to change the volume 10dB up and down between each switch. So I've played around with some other ideas. I tried toe-ing in my speakers so that they point directly at the listening position today (previously I was maybe 30 degrees offset) and redid the measurements using the chair position with myself outside of the room. Unfortunately any of the curves I built using the new measurements continue to have the muddy smeared sound that my last two attempts have had. The strange thing is that the initial curve/measurement slot that I've saved in the DDRC-22D from my initial measurement now sounds better with the speakers toe'd in, despite having been measured when they were in a different position. I'm beginning to think my UMIK-1 may be defective since my last several measurement routines have resulted in unlistenable results. Is there a way to test it? I notice that after that initial measurement the mic is picking up more different in response between the right and left speaker. I've always placed it right back into the foam box right after doing the measurements, could it have somehow degraded or failed? I'm also not hearing the aggressively rolled-off treble that it seems to be showing. Any help or ideas would be much appreciated, thanks! - That rise in base is very odd.. It's more than 15dB above the baseline. Are you using a massive sub in this setup? It's quite odd compared to typical settings , especially compared to a typical measurements. - If say your system were indeed with such a huge rise, maybe your feel of "killing the soundstage" is that you're just hearing a tamed bass? - Are you using a standard UMIK-1 with a short cable or maybe an adapter in this setup? - Do you have REW available? I'd recommend that you try to perform a simple measurement of before and after to see your measurement. I believe that what you feel is "killing your soundstage is simply related to the target curve. Target curve is the most important process to tweak to "taste". Maybe you simply need to raise that level to be tracking a bit more what your system is maybe typically doing (i.e. huge bass). Let's please get more info on your bass and we're here to help. Please feel free to contact our tech support team directly (support.minidsp.com). Thank you for the reply, and I apologize for my delay in getting back to you, I live in Florida and Irma pretty much consumed my last week. My speakers are Infinity Intermezzo 4.1t's, each has a passive tweeter, midrange, and woofer along with an internal powered 850 watt sealed 12" subwoofer. They have an F3 point of 23hz, but I was thinking room gain was leading to the bass response below that. I have played around with target curves and I prefer those that boost the bass a bit, and I really do like what Dirac is doing for my bass - it's making it much cleaner, removing some boominess and room nodes, and making things like the deep bass arpeggios found in pieces like Philip Glass's Koyaanisqatsi clearer and more defined. It's the effect on the midrange and treble that's worrying me, as it seems as if Dirac is compressing everything heavily in the horizontal plane. Without Dirac my soundstage seems to take up the entire wall that the speakers are on, running things through the DDRC-22D it sounds like everything is slammed into about a 3' horizontal space around my media rack. You could alway just use Dirac to only correct the bass and leave the rest of the frequency response alone. We can't comment much on the subjective comments as 99% of times, the feedback we get from customers is that Dirac is really beneficial to their listening experience. Maybe something related to the target curve as we suggested? As correctly suggested above, you can easily control where/what you want Dirac to control. Simply DRAG the curtain as per p29 of the user manual. Just drag what you want to correct. So, it turns out the problem wasn't with the DDRC-22D, it was with my Emotiva PT-100 Preamp. I stumbled upon the solution accidentally, but for some reason when you switch between the analog and digital inputs on this preamp, when you switch back to digital it somehow starts messing with the sound stage and heavily compresses things. As long as when I power the unit on in digital mode the effects of the DDRC-22D are great, with no penalty to the sound stage. If I switch between digital to analog and back to digital while it's playing I get the heavily compressed soundstage when I go back to digital, and then have to power cycle the preamp to get it back. It's weird, and I'm not sure why it's happening, but it seems to be an Emotiva issue with properly processing the signal when switching between analog and digital while the unit is on. Thank you for the help everyone, I was just chasing my tail in circles trying to fix the wrong thing. Glad to hear that you figured out! Thanks for giving us an update too.. Your experience with the unit (killing sound stage) was very much different to what everybody is saying about this unit..
Maybe worth for you to update the title of the thread? Last Edit: 1 year 6 months ago by devteam. We have run the PT-100 through the Audio Precision and tested it in everyday possible as well as in actual listening test. We are unable to replicate the particular circumstances that you are referring too in your email. Under all conditions the sound stage of the unit remains solid and fixed. The only way I can see the soundstage getting compressed is if the you are using a digital source that is running on the edge as it pertains to the clock. A miscue of the clock could cause it the left/right to get compressed. Is the clock on the DDRC-22D run close to the edge? I'm not sure what is exactly meant by "close to the edge" to be honest..
A) Isn't your PT100 feeding the DDRC-22D(i.e. reading above "Bluesound Node2 running through an Emotiva PT-100 preamp" )? i.e. Emotiva tech support suggesting that it's down to the source (i.e. bluesound) rather than miniDSP. Sorry to put you in the back and forth here.. Isn't someone having the exact same issue here? Are they using a miniDSP product as well? we haven't modified the DDRC-22D for the past 3years it's out and haven't heard of such issue before so a bit at loss as to what it could be.. It would sound like it's possibly not under our control though.. (i.e. other customer having similar issue without a miniDSP..